Yesterday I wrote about a visit with my doctor. One of the biggest take-a-ways from the appointment, as I mentioned, was his declaration of why I’m not feeling like myself: “You’re without a thyroid and you have likely entered menopause.” He declared it with a smile on his face and so matter-of-factly, that I had no choice but to nod and smile. To be sure of his assessment, he said that he’d run some tests on the blood that had just been drawn. Apparently, hypothyroidism and menopause have similar symptoms so the blood test will be a good way to determine if I have indeed, entered that next phase of womanhood. Well, there you go. Fairly unceremonious, don’t you think? A far cry from girls who, these days, have a spa day or a sleep-over with girl friends when they “become a woman”. As I was getting ready to write this post I Googled “celebrate menopause”. I thought, there’s got to be something. Sure enough I found it: World Menopause Day–brought to you by the International Menopause Society. Hot flashes, foggy brain, night sweats, mood swings, insomnia, weight gain–all things to be celebrated? Well, yes! I’ll look forward to celebrating on the duly designated day in October. 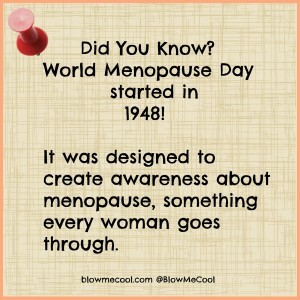 For today, I’ll thank Melissa for making it official, Happy Menopause Day! Is It Menopause Or Your Thyroid?